so I can start on what is going to be my first real eye-straining task - the point rodding. I've seen some fantastic jobs done by other members, on Wrenton in particular. If it can't even survive construction I have little faith that it will survive life on a working, luggable, layout either - so it's on to plan B, or maybe that should be plan D.
I guess that plan B was to try the plastikard rod but using superglue instead, another failure, and plan C was to try gluing 0.3mm wire on top of the plastikard stools but that wasn't too successful either. In both cases the superglue did try to melt the plastic a bit. I have some 0.2mm copper wire which I reckon works out pretty close to a scale 1¼", a little thicker after painting, which from memory is about right for prototype rodding. The plan is to make a jig long enough for the length required for a run of the same number of rods, with rows of pins at each end around which I can stretch the required number of "rods" for that run. I'll then slip lengths of rail crosswise underneath the wires (think a guitar fretboard) so that I can solder the wires to the railhead. I'll probably need another jig, comprising pins at the same spacing, to act as a "comb" to ensure that the wire spacing is the same at the working point as it is at each end and, therefore, even throughout the run. Once each stool has been soldered to the wires I'll glue a short length of the 0.3mm wire across the top to represent the upper rollers. When I have the entire run assembled I can (very carefully) remove it from the jig and transfer it to the layout, glueing each stool in place in turn. I'll still be left with fiddly in-situ work to add the cranks, rods under the tracks and joins between the runs (where the number of rods changes) but I think it's got to be worth a try. If it's of no interest, please let me know and I'll delete the post so that I'm not cluttering up your fascinating thread with my holiday snaps. Besides, if I don't have a go before my hands get too shaky and my eyes worse than what they are now, I'll never do it. No, no, it's very useful thanks. I presume that point is one of a crossover pair - since there's a rod going both ways from the crank. I'm really enjoying your thread; thank you. I like the Coniston branch and the Furness generally. Why do my eyes hurt, I hear you ask? The answer is that Coniston now has point rodding, after a fashion - and after a long spell spent peering through two pairs of specs and a magnifying glass whilst juggling the soldering iron, solder, tweezers and a scalpel. Here are a couple of pics of it as it stands, still with more to be done, a) when some more materials arrive and b) once I've managed to uncross my poor mincies. Plan D was the one that worked, 0.2mm wire soldered on top of lengths of rail, with a couple of changes from my original thoughts. Firstly, rather than doing separate runs for each number of rods required and attempting to join them I stretched the right number of wires across my jig for the maximum number of rods required in a particular run and stopped fixing individual wires where they need to be tapped off for connecting to a point. Some of these can be seen hanging loose (for now) in the second pic - one in the background to connect to the adjacent point and two in the foreground which will connect to a point off to the left and to its facing point lock. Secondly, I'm not bothering with gluing wires across the top to represent the upper rollers, the bulge of the solder will suffice. I'll be the first to admit that it's not perfect but from a "normal" viewing distance I do think it looks pretty reasonable, certainly the best that I'm capable of doing at this stage of my learning. I particularly like the appearance of the thirteen rod run coming south from the signal box to the right in pic 1 and shown close up in pic 2), I've managed to get the wires close enough together that from a distance it does look like a prototypical row of closely spaced rods. I'm sure it'll look better once I've tweaked the individual wires to get them straighter and more evenly spaced, then painted the rods with a rust wash and the stools with a dirty black - oh, and added the ballast underneath them. The next stage is to add the cranks and rods to the points. I intend to make the cranks from slightly thicker wire, bent to a right angle, soldered to the ends of the "loose" rods then glued to pads glued to the baseboard. 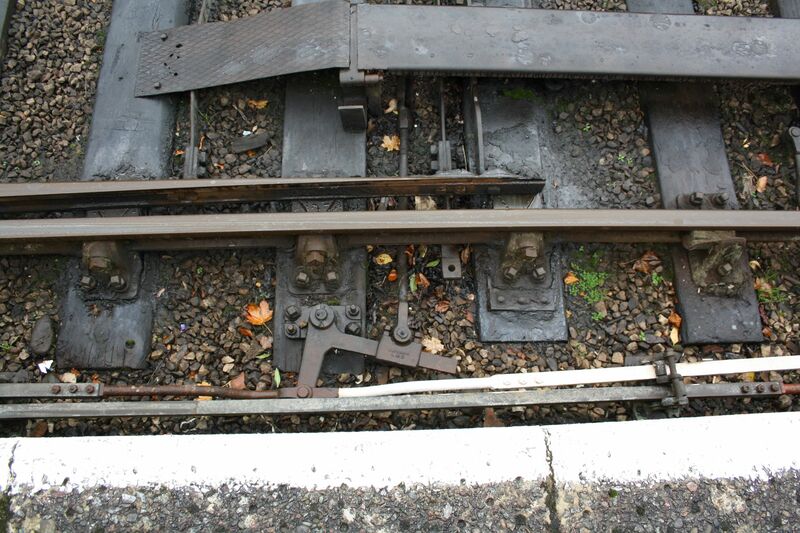 I'll make the cross-rods to the points from plastikard strip to avoid any risk of shorting between rails - once painted and partially buried in ballast they should look OK. Thanks, guys. I'm pleased with the way it's going. Not yet, I want to get the rodding finished first, plus I need to set the locations of all fixed structures (buildings, signals, etc.) beforehand so I can leave placeholders for them rather than get a load of stone thoroughly stuck down and have to go mining because I forgot something - well, I probably will forget something any way but I'd like to minimise it if I can. Thanks, I'll have a look at that before I start. The points are indeed my main concern - particularly since Coniston is, or seems to be, mostly points. It was only a moderately sized branch terminus but they still put nineteen of the blighters in - twenty if you count the camping coach siding hidden away around the bend at the northern end and twenty-one before they moved the coal yard from the northern end of the station to the back of the goods yard. 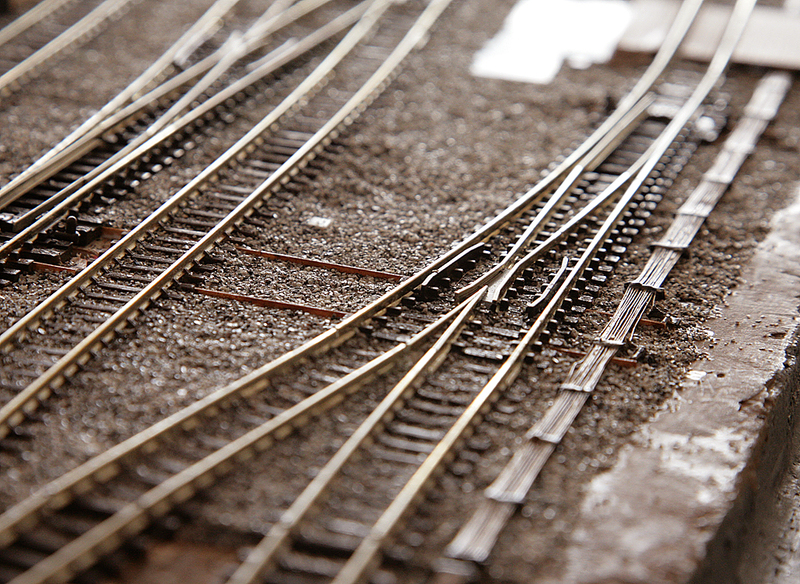 When I do start ballasting I'll kick off with the back siding in the goods yard. Firstly because it's a nice straight length with no points, secondly because if the first go isn't perfect it's the coal yard so it'll get liberally covered with coal dust and partially hidden by the coal staithes later. Then I'll work forwards so that, hopefully, I'll have got the hang of it by the time I get to the most visible areas. Also, having seen what some of chaps are using down at the club, I'm not sure if the ballast I've got isn't a bit coarse. If it is, then having it right at the back will allow the perspective to conceal that somewhat. "Dougal, this is fine ballast, that is far away." "Oh right you are, Ted"
Thanks, mate. Certainly will do before I start scattering stone. Well, that's torn it. I've finally run out of excuses so I've had to break out the bag of crushed stone. All the point rodding is now complete - no pics as yet because I've painted it, dirty black for the stools and a rust wash for the rods, so it doesn't show up very much against the brown base coat I've put on the boards. Once I've got the hang of ballasting in the goods yard, I'll jump to a bit of track at the front which includes some rodding so I have a suitable contrast for photos.. I have to confess that when it came to the cranks I did manage the individual ones for a single rod leaving a run but chickened out when it came to an entire set (up to ten roads) turning 90 degrees and diving under tracks. I just couldn't get several cranks all looking the same and nicely in line. anyway, where those ten rods cross a track it's right in front of the loco shed and I know they were boarded over in the four foot so I've taken the liberty of assuming that they were also boarded over outside the rails too. Since my last post I've determined the correct locations for, and sourced suitable (*) kits for, the main signals, ground signals, loading gauge, water crane and telegraph poles and glued small plastikard "pads" down where the items are to be located so that I can ballast up to those and save going mining to mount them later. I've also stuck down pads for where the buildings will go, for the same purpose, and raised the ground level in the goods yard to sleeper height because that's what it looks like in the photos. (*) suitable means modifiable in several cases. The starter signals will be fine as is but the station entry and advanced starter signals need quite a few alterations - to start with the posts need to be a lot higher because they needed to be visible above a bridge, then the platform entry signals need to be all at the same height on a 3-doll bracket whilst the source model is a junction set all at different heights, etc., etc. Likewise, the Langley lattice footbridge is close but not quite right, especially the split flights of steps with half landings, but I should be able to sort that. 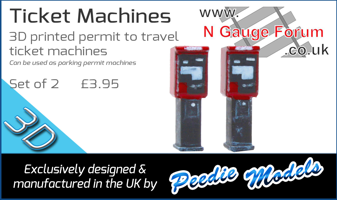 Thanks for the link, a very instructive clip - especially around the point mechanism. I think that one was OO gauge so had more space between the sleepers for painting in neat PVA, but I think I'll give that a try on my points too. I'll use the spread stone, tidy and dribble dilute PVA method for the plain track though. Having watched that vid, and a few others I've just done a test piece, a foot or so of track on a bit of wood, for practice. Hopefully it'll be ready enough by tomorrow evening for me tb be able to assess the results. It was somewhat coincidental that the vid opened with the reason for doing that particular point, because I'd also had to replace a double radius point with a straight one because I didn't like the way the stock ran through my original choice. 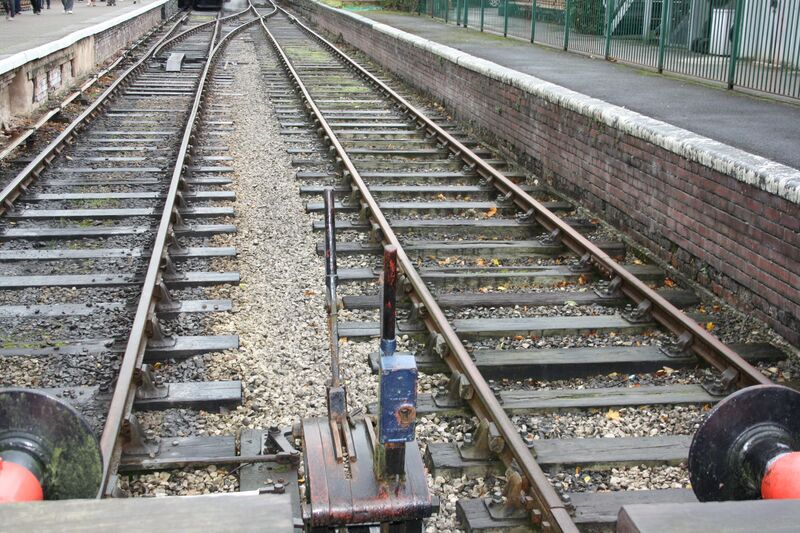 This is the 13-rod run south from the signal box, with one rod having already come off for the point in the background and two coming off for the point to the left, one for the switch blades and one for the facing point lock. The cross-rods will eventually be buried a bit deeper so they just show the edges and don't look so much like what they are, strips of plastikard. That'll be done when I've done all the first attack of ballasting and return to tidy up where needed. I'll also do the final tweaking of the wires then to get them as close to parallel, straight and level as I can. 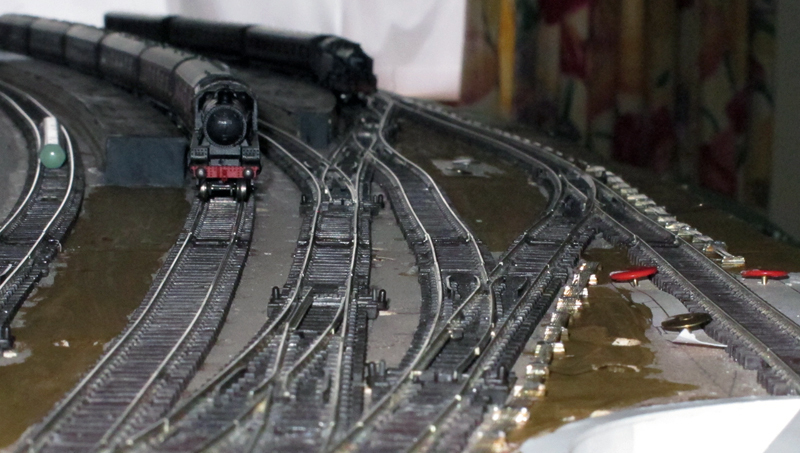 The big white blob in the background is the light reflecting off the plastikard pad that I've put down for the signal box base, with the boards covering the rods leading off to the right. 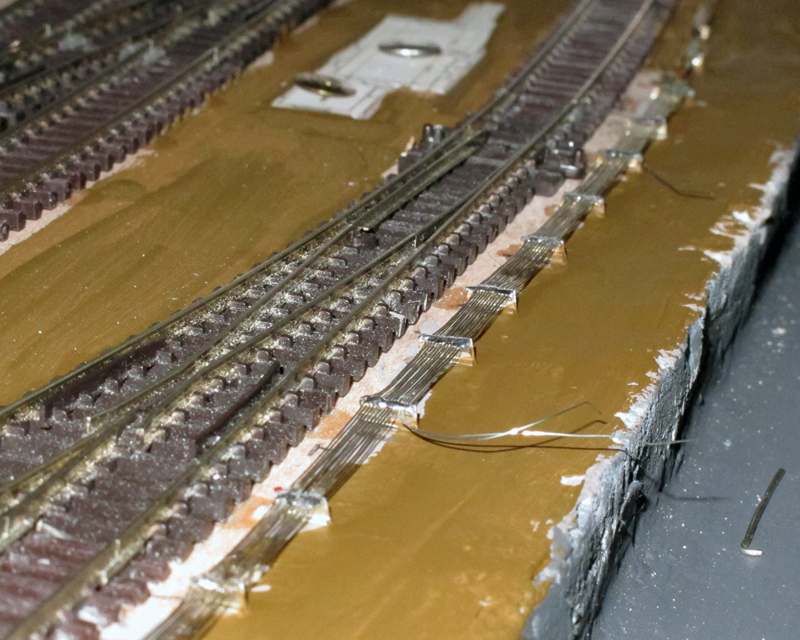 The ballasting is going pretty well. I've done about 90% of the visible part of layout and have had to stop because I've used up all my original pack and have to wait for the new stock to arrive. I haven't done any of the points between the switch blades yet, nor close to the tie rods, I'll do those when I'm having the general "tidy up" after all that I have done is fully set and I can see the bits that need touching up. The rodding looks absolutely fabulous!